Hefty wins for three Irish provinces means the competition for places is high. 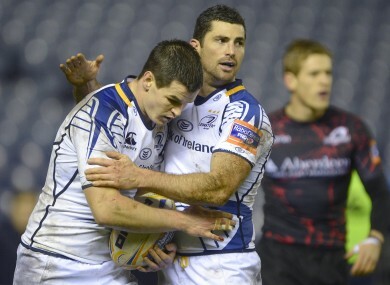 Jonathan Sexton is congratulated by Rob Kearney after his try. Called into action with just 15 minutes on the clock as Adam D’Arcy was forced off through injury. The 23-year-old showed little sign of inexperience and was an important creative influence in northern province’s backline throughout. Andrew sees off tough competition from two players that looked eminently comfortable under the high ball at the weekend – Robbie Henshaw and Rob Kearney. We’re headed into the most important section of the season and Trimble showed every inch of his big-game experience against the Scarlets. He carried well, caught several high balls expertly and iced off the display with a clinical curving cut through the Welsh defence. The wing played with the air of a man intent on winning his place in the national side, no matter how talented the young options who threaten him. Connacht’s Danie Poolman, who scored his third try of the season, is a close second. Tiernan O’Halloran may well be ruing the injury that saw him drop from the starting line-up over Christmas. Griffin has come in and delivered two outstanding performances at outside centre. Linked up well with Dave McSharry and made two very good line breaks. With Danie Poolman looking dangerous on the right wing, O’Halloran may have to wait a while longer to regain a starting spot. The young centre is beginning to underline a status as Connacht’s chief creative influence. The bright light in a scrappy game, McSharry claimed man-of-the-match thanks to expertly delivered passes resulting in a try either side of the half time break. Gordon D’Arcy put in a super display for Leinster too. The Tongan was a welcome return to the line-up for Connacht after he missed their away loss to Leinster. Was hungry from the ball from the start and made one superb, 60-metre break and linked up with Henshaw before some deperate Dragons defending prevented a try. It was heartening to see Leinster’s Luke Fitzgerald put in a 62-minute shift on Friday. 16 points from the outhalf and a fine performance capped with his side’s third try. Sexton initiated a lot of Leinster’s best attacks and his back and forth with Shane Jennings opened up a drained Edinburgh defence. An assured place-kicking performance too as he landed a penalty and conversion from acute angles. Played a part in D’arcy’s try too. Carried his team through an extremely lacklustre opening 40 minutes. His gliding runs and faultless place-kicking helped Ulster to a 9-3 half time lead they had scarcely deserved. After his pack upped the ante he was able to turn the screw with ease and ended the day with 16 points of his boot. Deservedly named man-of-the-match despite spending just 57 minutes on the field. However, in under an hour he managed to smashed hole after hole in the Scarlets defence. Scored one of his trademark impossible-looking touchdowns and, whilst holding off two tacklers, came close to laying one on a plate for Paddy Wallace until the Kiwi’s off-load was knocked out of the centre’s path. Connacht’s George Naoupu was on course to challenge him but was assisted off the pitch after being injured on 31 minutes. It was hard not to get the feeling after O’Brien’s man-of-the-match performance that the Carlow man is back in his stride at a crucial stage of the season. His work at the breakdown was vital in an attacking and defensive sense and he was the best forward on show from both sides. His 50-metre surge upfield in the second-half was O’Brien at his best and eventually led to the bonus point try from Ian Madigan. Connacht’s Eoin McKeon had good game at openside flanker and Number 8 when Naoupu went off injured. One offload that did come off for Williams was to devastating effect. The blindside picked up and raced under the posts to cap a fine display with ball in hand where only his number eight could eclipse the ground he gained. Also played a huge part in the second-half transformation of Ulster’s fortunes at the breakdown. Toner would not have been happy with his fumbling, unsure performance against Connacht at the RDS but he was excellent at Murrayfield against Edinburgh. Sean Cronin located him time after time in the lineout and he made some good attacking bursts when he wasn’t busy at the breakdown. An athletic display was summed up by a good claim at the back of a Leinster lineout, from which he turned and beat two covering defenders before presenting clean ball for Eoin Reddan to move on. The fact that Mike McCarthy raves about Swift so much will give you an indication of his importance to the Connacht pack. Easing back into league action after missing a couple of Pro12 matches but his 60-odd minute contributions in recent weeks have been invaluable to his team. Strong in the lineout and big tackles took care of ball carries from Andrew Coombs and the dangerous Toby Faletau. Even located the energy to show up on the wing in a couple of attacks – he was the first man in support of Poolman for his try. Unwanted by Leinster but Connacht are benefiting from his forward play and astute captaincy. Decided to put points on the board when the Connacht pack were marauding and drawing penalties in the opening 20 minutes. Took the responsibility for carries as, with a 9-0 lead established, thoughts turned to scoring tries. Gave Welsh prop Phil Price a tough evening’s scrummaging. Was withdrawn on 53 minutes but the result was already assured by that stage. Richardt Strauss may be fit for the Saturday visit of Scarlets but Cronin, in the past two league games, has done all that can be asked of him. Found his lineout targets effortlessly and made three breaks of note as Leinster pressed for a bonus point win. He made the line break that fractured the Edinburgh defence and led to D’Arcy’s try. Lost an early scrum against Willem Nel that gave Edinburgh three points but gained revenge on the South African twice and had him creaking for the rest of the evening. Showed up in the loose all night and secured an important first-half turnover. Delivered the killer pass that set D’Arcy free for the Leinster’s second try. *Did we make any glaring omissions? Let us know. Email “Pro12 Team of the Week”. Feedback on “Pro12 Team of the Week”.